A vintage 1976 Avon ring called Kensington. 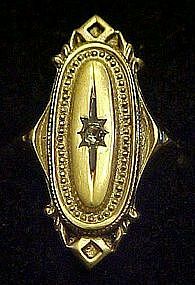 Designed to look like an antique Victorian style ring. 3/8" x 1" oval shape. Antiqued gold tone with a single center rhinestone.I have 2 available, A sise 7 1/2 and a Size 10. Both are in excellent condition. Please specify size when ordering.